Stephenie Bergman was born in London and studied painting at St. Martin’s School of Art. After working with sewn canvas she turned to clay as her medium. In 1985 she set up her studio in Ollioules in the S. of France. She uses clay as a construction material, rolled out in slabs, cut into geometric shapes and re-assembled. Large works are made with interlocking elements and often wood or cement are used in collusion with clay. Playing with a notion of function she re-invents familiar objects. In 2007 she went to Taroudant, Morocco to work on a project and now lives there for two thirds of the year. She installed her studio in a spacious old farm. 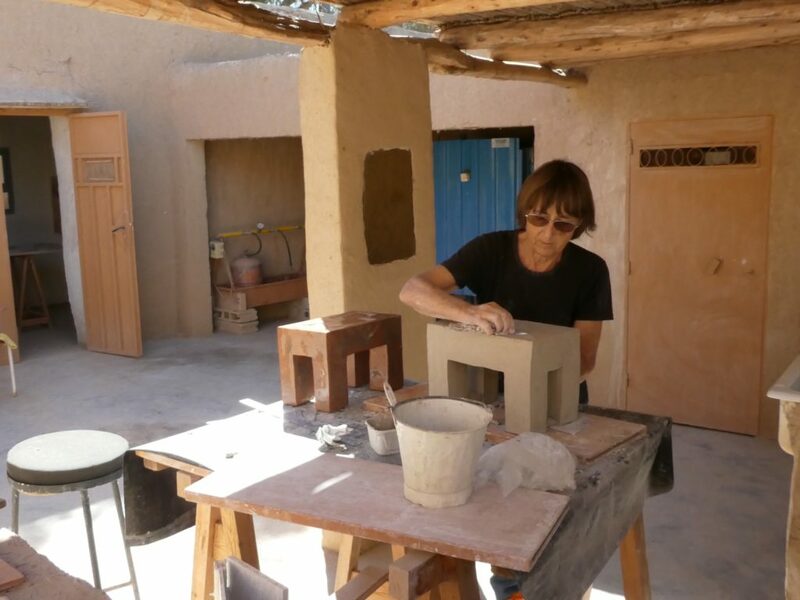 The mud building reflects the hand-made aspect of her work and way of organising space. She sometimes welcomes local kids for pottery sessions and has also received groups of students from London for short residencies. She has worked on many commissions for houses all over the world.